In the days after the widespread commemorations of the 100th anniversary of the end of the first world war, there’s a sense of cultural anti-climax. For the past four years, British theatre, as well as other arts, have been revisiting what was once called the Great War, and now it’s slowly slipping back into oblivion. But if there is a good argument for remembrance, and there is an equally good one for forgetting, what you can never forget is the War Horse experience. This mega-hit was originally staged by the National Theatre in 2007 and has subsequently not only been revived and remounted, being seen by more than seven million people worldwide but has also been made into a film by Steven Spielberg in 2011. Now the show returns to the National, after a 10th-anniversary nationwide tour, and this is a good excuse to see it again. Opening just before Armistice Day, this version of the show retains all of its emotional force and its intoxicating theatrical flair. Telling the story of Albert, a Devonshire lad, who falls in love with Joey, a horse who is a mixture of stolid cart puller and speedy hunter, the play is an epic that takes off when the young horse is requisitioned by the army at the start of the first world war. During this murderous conflict, Joey is ridden in cavalry charges, captured by the German army, used to pull medical wagons, and is finally wounded. In order to find his horse, Albert enlists in the army, even though he’s underage. So he also suffers the horrors of the war to end wars. Needless to say, the pair are happily reunited in the end. To audience cheers as well as tears. Based on the original book by Michael Morpurgo, Nick Stafford’s stage adaptation is unsentimental in that it refuses the temptation to give Joey, or indeed Topthorn, a majestic black beauty of a horse, a Disney-like voice. As conceived by Tom Morris and Nicholas Hytner, the story is told around the horses, whose sheer presence is strong enough to make us interested in their experiences, and there’s no need to make their personalities cute. Directed originally by Morris and Marianne Elliott, helped for this tour by Katie Henry, and making the most of Rae Smith’s stunning designs, especially the drawings and video projections, this staging retains the full force of the original, and gives the English language to the German soldiers (who originally spoke their native tongue). Without a doubt, the main attraction of War Horse is not the plot, which rambles across the battlefields of Europe, but the puppets. Created by Basil Jones and Adrian Kohler of the Handspring Puppet Company of Cape Town, the two main horses, Joey and Topthorn, are magnificent larger-than-life beasts. Creatures of cane, gauze, and wire, the only realistic thing about them are their glass eyes, which reflect the stage lights. The puppets have a deliberately unfinished appearance, but although they don’t really look like real horses, their movements effectively mimic those of an animal, enabling the puppets to communicate feelings such as curiosity, contentment, and fear. Each horse has three puppeteers who give life to their head, heart, and hind parts. 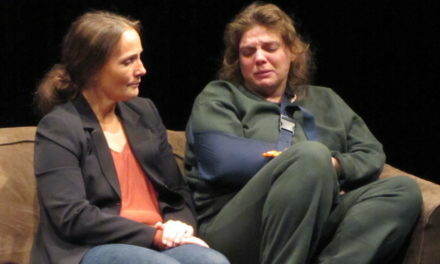 And it’s this acting, that gives the show its emotional punch. One of the story’s several contradictions is that you end up feeling more for the horses than for the humans. As a show, it has its fair share of spectacle, with not only puppet horses but also terrific moments of warfare, from cavalry charges to a tank bursting onto the stage, a symbol of the end of an era. With thunderous gunfire and frightening explosions. The other puppets, from the soaring birds to the comedy goose, likewise claim your attention. 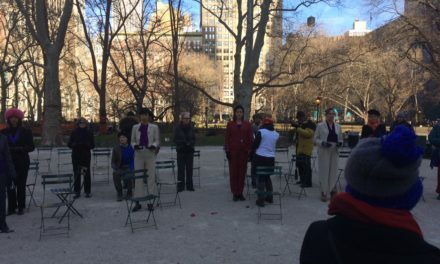 But what is the play’s message? Although Stafford’s adaptation ignores the main 1960s myth of the Great War—that the soldiers were working-class lions led by upper-class donkeys—he does honor the original’s idea that the animals are neutrals caught in one of humankind’s most monstrous wars. Indeed, the play hates war and loves horses, who come across as more noble and more heroic than any person. And some of the people are hardly attractive: Albert (well played by Thomas Dennis) is a good boy, but his father, Ted (Gwilym Lloyd), is a reckless drunk who defies the good sense of his wife Rose (Jo Castleton) to gamble and behave irresponsibly. 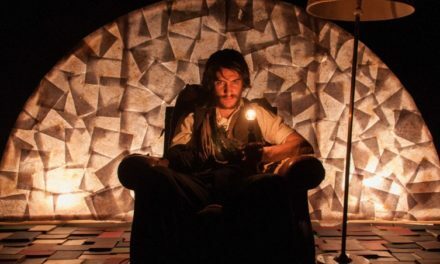 Billy (Jasper William Cartwright), who is Albert’s cousin, has a cruel streak, as does his father (William Ilkley), who is always goading the susceptible Ted. In Flanders fields, the main German officer, Friedrich Müller (Peter Becker), is scarcely more attractive, although he does have a good rapport with animals, and the locals—mother Paulette (Arinder Sadhra) and little Emilie (Joëlle Brabban)—might have been more sympathetic, if the playwright had developed their characters a bit more. Most of the rest of a huge cast are likewise paper thin, but what does that matter? This is a show where the animals rule. 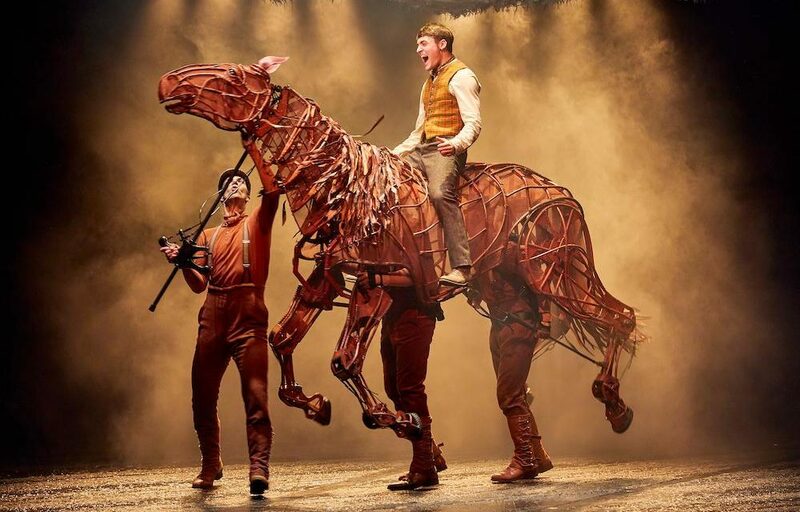 War Horse is at the National Theatre until January 5, 2019.